Welcome to The Embassy Suites Brunswick Hotel- the very best in Brunswick hotels This beautiful all-suite hotel is located two miles from I-95 along Georgia's Colonial Coast. 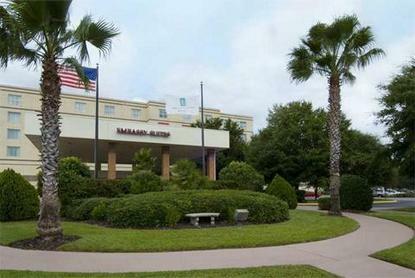 Our hotel is ideally situated between Savannah, Georgia and Jacksonville, Florida. Our Brunswick, Georgia hotel is connected to the Colonial Mall at Glynn Place. The hotel is located just minutes from many Georgia attractions such as the Emerald Princess Dinner & Casino Cruise, the Georgia Island Factory Shoppes, and the Federal Law Enforcement Training Center- FLETC.The Embassy Suites Brunswick Hotel boasts 130 two-room suites that are equipped with mini refrigerators, microwaves, and all of the comforts of home. Guests of the hotel receive complimentary cooked-to-order breakfast daily and a nightly manager's reception Monday through Saturday. High-speed Internet access is available at this Georgia Hotel for a nominal fee. The Embassy Suites Hotel has all that is needed to create the perfect Brunswick, Georgia vacation. For the Best Rate Guaranteed with no booking fees, book your Georgia Hilton hotel room online today at embassysuites.com.Embassy Suites Brunswick Hotel is just minutes from: View our Brunswick Event Guide, St. Simons Island's golf courses & beaches, Historical sites and Championship Area Golf, Family fun at Summer Waves Water Park on Jekyll Island. Embassy Suites Brunwick Hotel is just a short drive to: Okefenokee Swamp, Kings Bay Naval Submarine Base, Sea Island, Sapelo Island and Cumberland Island.